Put on a pot of water for cooking the pasta, and add a large pinch of salt. In a large bowl, combine the olive oil, lime juice, honey and salt. Whisk to mix. 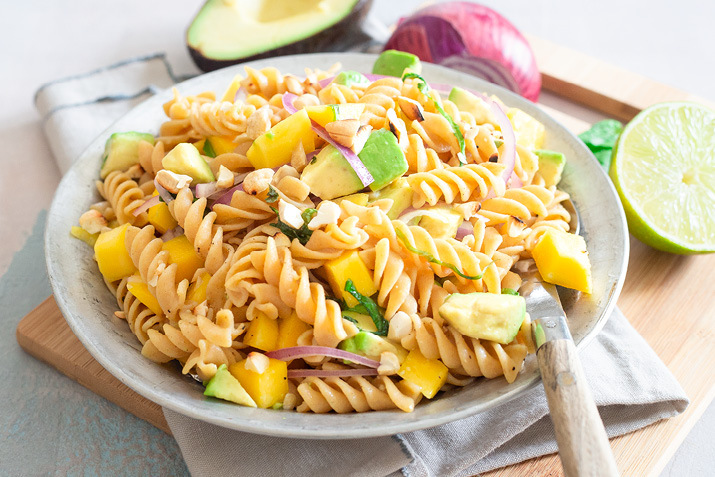 Add the mango, avocado and red onions. Cook the pasta according to package directions, about 10 minutes, then rinse and drain. Add the pasta to the bowl; toss to coat and mix well. Mix in the basil and top with cashews.